Aurora's Holiday Stocking Stuffer Gift Ideas! - Aurora Multimedia Corp.
Aurora's Holiday Stocking Stuffer Gift Ideas! Aurora’s Holiday Stocking Stuffer Gift Ideas! Looking for a few ‘last minute gifts’? Consider Aurora’s new DXB-8 low-cost button panel and add AV management to every room this year! 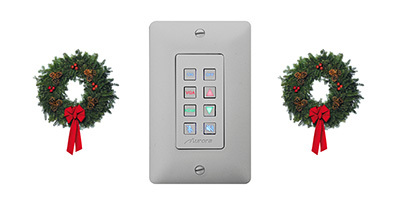 Aurora’s new DXB-8 low-cost 8-button single-gang wall panel will keep your budget on Santa’s Good list! The DXB-8 has two RS232 outputs for stand-alone control applications and also mates with Aurora’s award winning DXW-2 series HDBaseT Wall plates allowing RS232 control via HDBaseT to the display over a single umbilical. The new button panel comes in Black and White with an assortment of laser-etched backlit buttons. Over 50 additional buttons are available to choose from and custom buttons can be created. With Aurora’s free DXI Programming software, the DXB-8 can easily be programmed within a single page for easy viewing of the entire project. Each button can be configured with RS232 macros executed during a press, release or press & hold ramping for clean volume control. The DXI Programmer also allows each button’s backlight to be programmed in Red, Green or Blue. With its .48″ depth, the 1-gang Decora® button panel can easily be installed in the wall or table mounted.